Happy holidays from RAID camp at Minna Bluff! Pardon our long ‘radio silence’ while we got camp established and then ventured into the unknowns of experimental drilling. Right off the bat we had a long weather delay and then after early test drilling we discovered a problem with the drill’s hydraulic system. That took about a week of chasing down fluid line pressures, checking torques on the drill, and looking for either blockages or leaks. To no avail. In the end, we chalked that issue up to the ‘mysteries of the universe’ and decided we could forge ahead without compromising the drill. 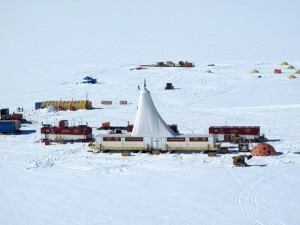 Tent city part of RAID camp, with the Ross Ice Shelf and Minna Bluff in the distance. Early morning light on new-fallen snow. Our camp is very similar to last year’s. 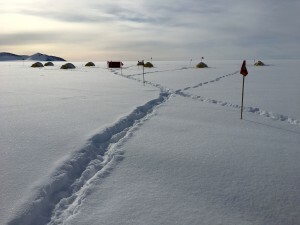 From the air it’s a neat and tidy group of small buildings (wooden platform tents), sleeping tents, and the RAID modules parked on their skis. Once on the ground you see it’s a small town complete with community center, rec center, lavatories and shower, tent city, a fuel depot, vehicle parking, science lab, and freezer storage for both food and ice samples. All together we are a group of 15, including four who run the camp, six drillers, and five in the science team. 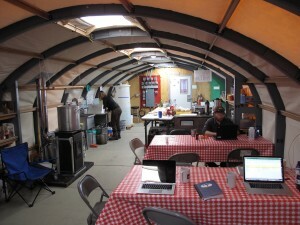 Amazingly, we have a fairly robust wifi now, so we’re able to communicate from a seemingly end-of-the-world location. 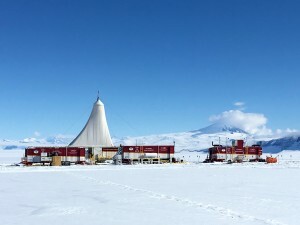 RAID camp from the air, with drill rig modules up front and camp in the background. RAID drilling system with Mt. Discovery in the background. Galley of Minna at the Bluff. Plenty of free parking! Room for two Cat Challengers and Martha, the friendly skid-steer. Once up and running, our first job has been to make a 7-inch borehole in the upper firn zone so that we can then insert a pressurized device called a packer that is needed to contain the fluid used in ice drilling. This step was our big hangup last season. We’re still experimenting! 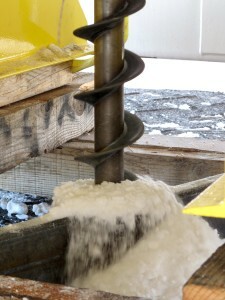 We use steel augers with an ice-cutting head to bore through the upper firn zone and penetrate into impermeable ice below. 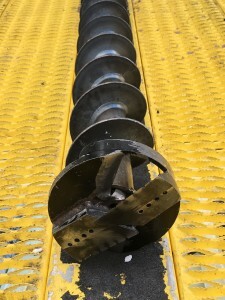 Steel augers used for cutting into firn, with sharpened cutting head. This year we’ve tried different sizes of augers, different cutting head configurations, and variations in cutting speed and penetration rate. In our first hole we just weren’t clearing the cuttings out fast enough and the augers became jammed with ice cuttings. After some retooling, we successfully cut a borehole to 97 meters (318 feet) below the surface, which we think is a new record for ice. Unfortunately, after setting the packer in the hole we were unable to keep a pressure seal with compressed air, so we decided it was time to pull out and abandon that hole. Driller Matt joining up augers at the drill head. 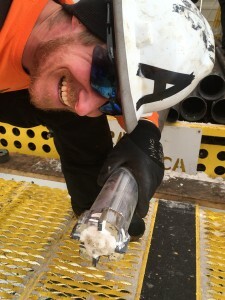 We moved a short distance over, which took the better part of a day, and the next day proceeded to auger to a depth of 105 meters (345 feet), also a new record for augering in ice! The augering went very smoothly and we seemed to get good evacuation of cuttings from the hole. Ice cuttings coming out at surface from augers at 105 meters depth. After initial excitement about the deep penetration and safely getting all the augers out of the hole, we discovered that there were ice cuttings piled up in about the lower third of the hole, meaning that we had much less recovery than in earlier boreholes. Our hopes for a quick packer test were dashed and we faced the prospect of long hard work to ‘bail’ the hole of cuttings using some custom RAID tools. After the better part of a day in that mode, we decided our time was better spent starting a new hole to see if we can go yet deeper and get enough clearance for a packer without bailing. That’s how we’re spending Christmas day! 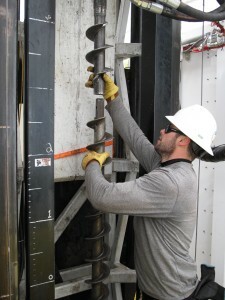 Driller AJ inspecting a rod of NQ after dry drilling into firn. So, just like that old Joni Mitchell song — “And the painted ponies go up and down; We’re captive on the carousel of time.” — we go up and down, both literally with the drill, and from emotional highs to temporary disappointment. 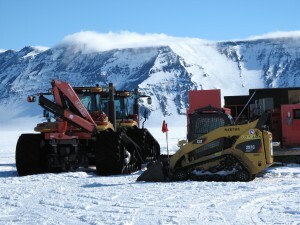 It’s all part of the progress as we experiment, learn, and open new territory of ice drilling. Stay tuned, there’s more to come as we set up for Hole 3.